Defendants Micah Kanahele, bottom right, Rosalino Ramos, Jason Rumbawa and Anthony Brown are on trial for a second time for the murder of Greg Morishima, gunned down in his Pearl City carport. The first trial ended in a hung jury. 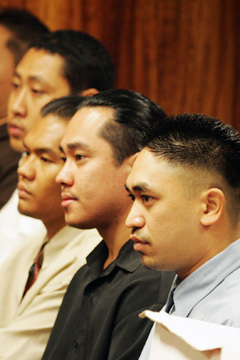 A state court jury was in its 10th day of deliberations yesterday in the retrial of three men accused of killing an Aiea man in a 2003 botched robbery attempt. The first trial of Micah Kanahele, 24, Rosalino Ramos, 24, and Jason Rumbawa, 25, on second-degree murder charges in the death of Greg Morishima ended in a mistrial in April. Also on trial is Anthony Brown, 24, who is charged with first-degree robbery. The jurors on Wednesday posed a written question to Judge Michael Town, asking whether they must "decide who pulled the trigger ... in order to convict any given person of second-degree murder." Town told them to refer to his instructions to the jury, particularly the text referring to "accomplice liability." The panelists last week asked to be given the transcript of testimony by the prosecution's key witness, Kevin Harris, a co-defendant in the would-be robbery. The edited trial transcript was not provided to them until Wednesday afternoon, after they had presented their second question, said Arthur Ross, attorney for Rumbawa. "The question was kinda scary." Ross said. "They are obviously wrestling with some thoughts." He said it was difficult to draw a conclusion or predict a possible second hung jury. The April trial ended after that jury deliberated for eight days and concluded it could not reach a unanimous verdict. Harris was originally charged with first-degree robbery in the case, and later pleaded guilty to second-degree robbery in exchange for his testimony. He told police that he accompanied the other four men to a Pamoho Place home on Oct. 26, 2003, where they hoped to steal drugs after unsuccessful attempts at two other homes. He testified that there was no plan to kill Morishima, 49, who was visiting friends at the house. The resident told police that Morishima was gunned down in his carport after laughing and commenting that "it's too early for Halloween" to a group of masked men approaching the house. The defense lawyers argued that Harris made up the story to deflect blame from himself. Jurors went home yesterday after deliberating for a half day. They are scheduled to resume deliberations on Monday.